WASHINGTON — Vice President Mike Pence directed NASA to return humans to the surface of the moon by 2024, a dramatic acceleration of the agency’s human space exploration plans but a directive accompanied by few technical or fiscal details. 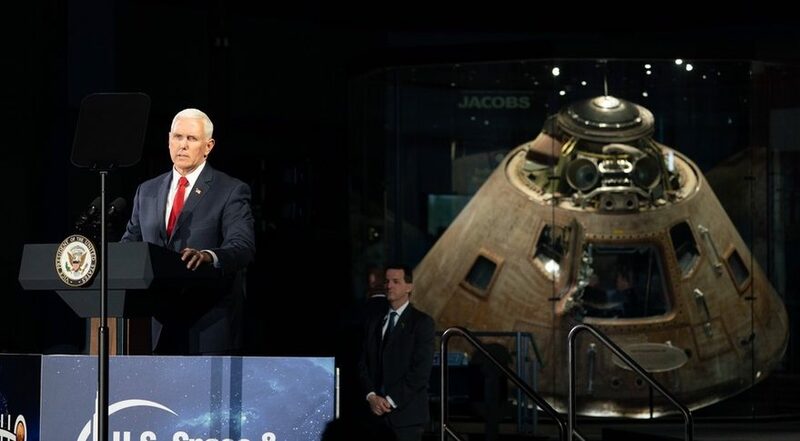 Pence, speaking at a meeting of the National Space Council March 26 in Huntsville, Alabama, said a new sense of urgency was needed in NASA’s plans given delays in ongoing programs like the Space Launch System and concerns about rising international competition. That schedule would require a major acceleration of many elements of NASA’s plans, which previously called for landing humans on the moon by 2028. Among them is the SLS, the heavy-lift rocket whose continued delays led NASA to consider shifting the next uncrewed test flight of the Orion spacecraft to commercial vehicles. Pence cited as a reason for this new urgency competition from Russia and China, although neither country has formally committed to plans to land humans on the moon by the mid-2020s. “We’re also racing against our worst enemy, complacency,” he said, citing as an example the launch of Sputnik in 1957 that shocked the United States. The vice president’s call to action was accompanied by few details, including how the program will be accelerated and at what cost. The council unanimously approved a set of recommendations about those plans at the end of the two-and-a-half-hour meeting with no debate, but the contents of those recommendations were not immediately disclosed. NASA also didn’t release additional details about its plans, although Bridenstine’s comments at the hearing suggested they still included development of a lunar Gateway that would enable access to the lunar poles. Bridenstine said in the statement that, to implement this as-yet-undefined plan, NASA will form a new mission directorate “to focus on the formulation and execution of exploration development activities” called the Moon to Mars Mission Directorate. The agency didn’t explain how the new directorate would differ from the Human Exploration and Operations Mission Directorate, currently charged with implementing NASA exploration plans.